Venice, Italy. Plan a Venice Vacation to find great deals on hotels and airfare. 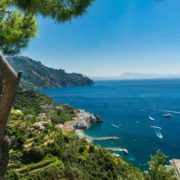 Italy gives to visitors the opportunity to discover the history of this country between monuments and architecture beauties as well as pretty landscapes and natural wealth. Certainly, looking upon Italy one is the compelled journey among many, a stay in a peculiar and unique city of Venice. Venice is located on the Venetian lagoon in the Gulf of its name, about 28 km from the town of Treviso (with a low cost airport) and for its distinctive feature of the “Aquatic” city has the topmost tourist’s flux in Italy. Declared in 1987 by UNESCO, humanity’s heritage welcomes tourists every year with its historical heritage surrounded by the entire lagoon. Known for its Carnival and beauties which attracts millions of tourists during the period between spring and autumn, is a “gem” to visit at any time, to live the magic of its 118 islands linked together by 354 bridges and then divided by 177 between canals and rills. Among the islands, the Lido welcomes the International exhibition of art cinema which is Venice meeting point of many celebrities while the island of Murano is celebrated worldwide for unique glass working, in addition, there is the characteristic lace worked on the island of Burano, also famous for its very colorful houses. St. Mark’s Square is the heart of the city, offering so many museums that you could spend your whole day in this area alone. Since you only have a day, however, take a self-guided walking tour instead and snap some scenic pictures along the way. You will get a great view of the basilica and the bell tower. If the line is not too long in front of the basilica, taking a look inside is well worth it. This church is unlike any other, decorated with golden mosaics and a magnificent 10th century altarpiece. After seeing the church, head towards the Doge’s Palace. A visit to the museum inside would take several hours, so head towards the inner courtyard instead to be able to fit it all into a one-day trip. Enter through Porta della Carta which is located right next to the basilica. The inner courtyard features the Giant’s Staircase which was used for the crowning of the doges. Continue walking along the palace towards the water where you can enjoy scenic views of the island of San Giorgio Maggiore. From there, hear east to Ponte della Paglia from which you can have a good look at the famous Bridge of Sighs. If you are looking for unique destinations in Italy, the Bridge of Sighs is a small stone structure that connects the interrogation area in the palace with prison cells. It was built in 1600 and received its name because of the sighs of the prisoners that were lead to the terrible prison cells. To see the bridge, follow the length of the Doge’s Palace along the shoreline until you reach Ponte della Paglia which faces it. Ponte della Paglia is always filled with visitors trying to take a picture, except very early in the morning. The exterior is made of white limestone and small windows have stone bars. You can visit the interior by taking a tour of the palace. Finish your tour of the area with a drink at one of the outdoor cafes, listening to music played by open-air orchestras. 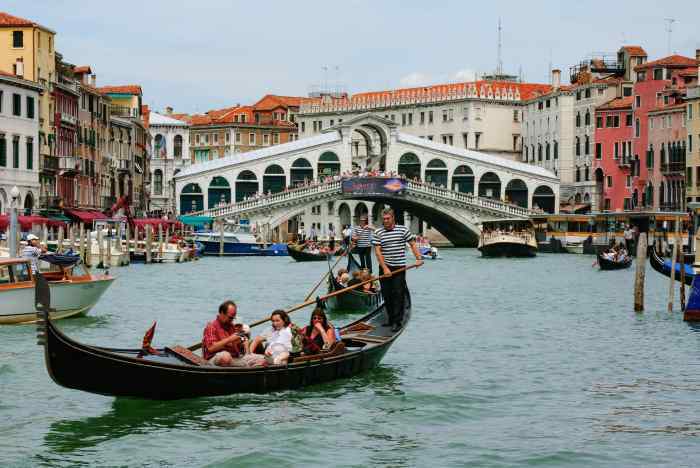 Another must-see attraction is the Rialto bridge which lies to the north. To get there, simply follow the yellow signs on buildings – the walk takes about 30 minutes. The Rialto is one of the most photographed sights in Venice. During the day, the area becomes alive with cafes overlooking the grand canal, food stalls and jewelry shops. The structure is world-famous and has been replicated in places like Las Vegas. You will find it at the Venetian hotel. If you ever get lost in the city, look for this notable landmark to orient yourself. The area is bustling with shops, restaurants and hotels so there is plenty to see and do. Late in the afternoon, head southwest towards Sampo Santo Stefano and dine at Ristorante Masaniello which has tables outside. Finish your tour at the nearby Accademia bridge where you can catch a vaporetto heading back to your car or the train station. A Gondola ride is probably the most cliched and touristy thing to do in Venice. Cliched it may be but it’s a wonderful tradition and essential for anyone wanting a complete “Venice experience”. Even better, for those of a romantic persuasion (aren’t we all? ), is a sunset gondola ride, a serenade and then a candlelight dinner. This, in the world’s most romantic city, has to be the most romantic evening you’ll ever spend. Enjoy a boat trip out to the famous Venetian islands of Murano (home of Murano glass) and Burano (home of lace). I have always found the demonstrations of glass blowing in Murano to be fascinating, actually everything about Murano is fascinating. Given the constant inflow of tourists that the city each year must receive there are in Venice, many characteristic hotels as the authoritative Hotel Ala, located in the heart of the city, near the famed St. Mark’s Square. Its a three stars hotel, among the best of Venice, and offers to customers who stay in its 85 rooms decorated by Barocchetto Venetian-style and the original eight hundred and nine hundred furniture, to be able to take pleasure in fully the feel of Venetian living and pass some unforgettable days. The only way to pass around, if you don’t visit walking, you can go in gondola or a ferry: visit the Venetian markets, small typical shops, and anyone that sojourns if only for one day this magic city will be more rich. The stay in Venice continues to be a must in choosing a journey between the wonders of Italy, among the many luxury hotels that stand out for the cities, or resort on coastlines, at the famous lakes, mountain or in splendid hills, but for certain in a Venice hotel you can live an extraordinary charm that has no equal.